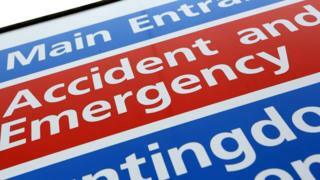 Injuries from violence in England and Wales fell “substantially” in 2016, an annual study of people treated in accident and emergency units suggests. Cardiff University’s survey of 152 hospitals found 188,803 people were admitted for injuries from a fight or assault – 10% fewer than in 2015. The figures are the lowest since 2001, when the survey first recorded data. But they are at odds with police statistics which have recently recorded increases in violent crime. The study’s lead author, Professor Jonathan Shepherd of the Violence Research Group at Cardiff University, said there had been a substantial decrease in violence-related injuries for both men and women in 2016 compared with 2015. Since 2010, researchers found a decline of 40% in people needing treatment in emergency departments after violence, he added. Decreases in drug uses and binge drinking were said to be possible reasons for falls in violent incidents. But the group’s latest report, which also assessed records from minor injury units and walk-in centres, said casualties peaked at weekends – suggesting that alcohol-related violence remained a significant problem. The data showed males and people aged 18 to 30 continued to be at most risk from violence. Violence-related injuries sustained by children aged up to 10 showed a year-on-year rise of 10% in 2016. The research does not examine the reasons for the decline in violence but better detection and reporting of serious violence by emergency departments and more targeted policing were also cited in the report as possible factors. Prof Shepherd told the BBC that increased CCTV which allowed police to target incidents quicker and efforts to reduce domestic violence should also be taken into account. He said the substantial year-on-year decline meant “costs imposed on health services and the criminal justice system by violence have been substantially reduced”. Earlier this month, Metropolitan Police figures showed sharp jumps in recorded knife and gun crime. And police in England and Wales recorded an annual rise of 22% in offences recorded as “violence against the person” in the year to September. Statisticians, however, say this was largely driven by changes in recording processes and the inclusion of additional harassment offences. Pro Shepherd maintains police records are a “very unreliable measure” of the type of violent injuries his research tracks. “The threshold for violence with injuries as far as police are concerned has come down, so there are a lot of offences that are included in violence with injury that actually never used to be,” he said.